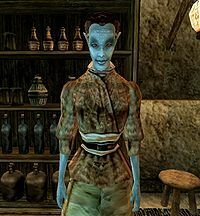 Moroni Uvelas is a Dunmer trader who runs a small liquor store in the Brewers and Fishmongers Hall, located in the western corridor of Vivec's St. Olms Canton waistworks. Her husband, Danar, is a known skooma-addict, and has recently gone missing. She wears a common shirt with matching skirt and shoes. Aside from her natural resistance to fire and the sanctuary provided by her ancestors, she knows the following spells: Demoralize Beast, Rally Beast, Demoralize Creature, Demoralize Humanoid, Rally Creature, Rally Humanoid, Almsivi Intervention, Detect Enchantment, Tevral's Hawkshaw, Almalexia's Grace, Divine Intervention, Mark, Recall, Telekinesis, and Detect Creature. Greeting: "Greetings, traveler. Perhaps I might interest you in some wares? Although, it is hard to work with my poor husband gone missing." Danar Uvelas: "Yes, that's my husband. I only wish I knew what had become of him." "Yes...my husband, Danar Uvelas, is missing again. It happens with him. See, he has a problem with skooma, although he swears he's been trying to stop. Last time he disappeared it was for days, and when he came back, he didn't look so good. I'm worried that he might have been infected with corprus, or something equally horrible. Do you think you might be able to find him for me?" I will find your husband: "You will? I can't tell you how relieved that would make me. Danar and his no-good friends sometimes take to the Underworks near here when they've got some skooma. You might find him down there." I cannot help you: "No? Well, I can't blame you. My problems are my own, and I've no reason to expect anyone else to help me out." "I just want to find my husband again." "You've found my husband's ring? Oh, he must have.... Oh, no. Then the worst has come to pass. I can't say that I'm surprised, though it is difficult to hear. He had been heading toward such an end for years now. Thank you for your help, %PCName. Please, take this for your troubles. Maybe they will do you some good." Latest rumors: "Rumors? Sorry, I haven't really been paying attention to those things since my husband has gone missing." Moroni Uvelas: "I am she. How may I help you?"